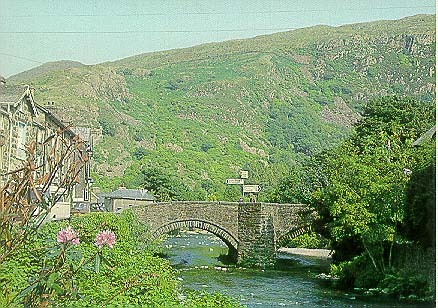 Another charming village in North Wales. It owes its name to the sad story of GELERT. In the 13th century, Llewelyn, Prince of North Wales, had a palace in the spot. One day, he went hunting without GELERT, his "FAITHFUL HOUND", who was unaccountably absent. On Llewelyn's return, the dog, stained and smeared with blood, joyfully sprang to meet his master. The Prince, alarmed, hastened inside and found his infant son's cot empty, the bedclothes and floor stained with blood. Rushing to judgment, the frantic father plunged his sword into the hound's side, thinking it had killed his heir. The dog's dying yell was answered by a child's cry. Llewelyn then discovered the baby unharmed, laying near the body of a wolf, which Gelert had slain! The Prince, filled with remorse (and rightly so), is said to have never smiled again. 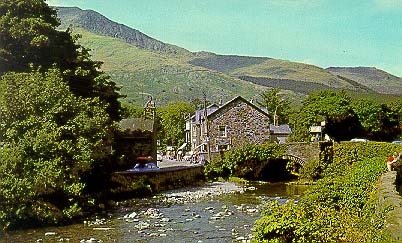 He buried Gelert in the spot now called -- Beddgelert.